Today is the winter solstice in the northern hemisphere, the first day of winter, and the shortest day of the year. We're not likely to notice the sunset this evening, though, if you can call 4:14 PM evening, since it's likely to be rainy and/or foggy on this unseasonably warm day in Provincetown. So to mark the occasion, and to glean a bit of joy in keen anticipation of the few moments more of daylight we'll be soaking up over the coming week, I dug out one of my favorite sunset photos from last winter to enjoy in lieu of this afternoon's fog and drizzle. 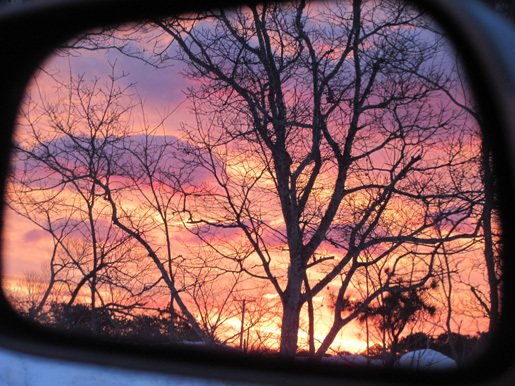 It's the sun setting in my rearview mirror one day last winter as I drove along the edge of the cemetery, on Jerome Smith Road. I'd have missed this sunset if I had tried to pursue it, so I stopped smack in the middle of the road to savor it. When I turned onto that little street precisely as the sun was setting, I knew I'd miss it if I tried to turn around and race out to the beach for the view behind me, and, after all, it is Provincetown, so I stopped right there in the middle of the road to luxuriate a bit in that gorgeous, evanescent moment. In less than three minutes, that moment was gone, the sky was graying, and that, my friends, is the significance of the tiny bit of extra daylight we'll realize by this time next week. Coming down the road in three minutes less light I'd have missed that view, which turns out to be a moment I can recall to soften my heart and raise my spirits, and it's helped in every case where I've tried this little smidgen of therapy over the past year, which was a doozy, by the way. In seven days the sun will be setting five minutes later, and by the summer we'll be gaining a couple of hours of morning light, and nearly 4 hours in the evening, so the thought of nearly six more hours of daily sunlight to enjoy the stunning beauty that surrounds us is raising my easily-tanked winter spirits. This too-mild weather we've been having is really terrible for the planet, but when it's combined with a few minutes more of light day by day, and potentially just about enough money saved up this year to get through an uneventful winter without any major setbacks, (we can dream, can't we?) well, all that has me barely dreading the winter at all. Now, if we can get away with something less than eight feet of snow over these next 15 weeks… we'll have it made.